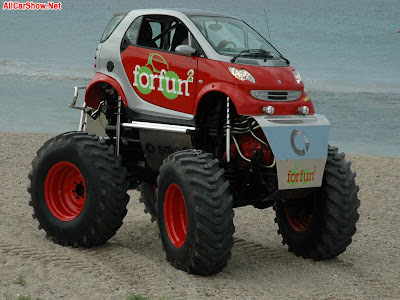 Smart ForFun2 a-la Monster Truck! - Go For Fun: Travel, Sailing, Photography - Inspiration, Tips, Adventures - Australia and The World! 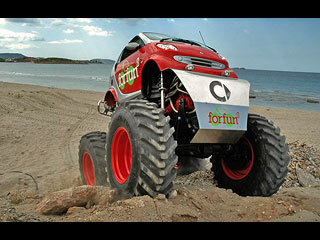 Home Car Smart ForFun2 a-la Monster Truck! 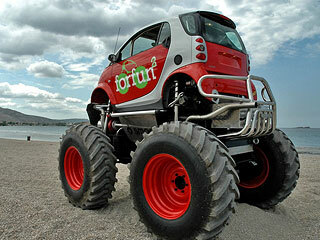 Smart ForFun2 a-la Monster Truck! Nowadays we are so used to the tuning that there is hardly anything by what we can be surprised at. The word “hardly” was used intentionally because what is going to be introduced to you was not here before and there is a possibility that there will not be nothing similar so soon. It is possible to see a different kinds of car marks. A big BMW, a medium 206 and even small Smarts. We can increasingly hear about the individual foremen of a series cars who rather prefer to introduce their car by themselves than to let it be entrusted to the hands of some experienced firm. There is nothing to be wondered at because a pleasure of a car is much more bigger if it is a work of its owner. What is necessary to mention is that sometimes the products are really tremendous and unseen. Especially if we are talking about such a curiosity which is going to be introduced. Everyone of you has seen at least once in your life a car Smart. It is little, isn´t it? But what if you see it reaching the height 3.7 metres? Impossible? We are introducing to you Smart ForFun2 in Stephanos Attard version. What kind of car would buy a woman who needs to orient herself in the traffic with no problems and at the same time she would like to be stylish. One of the possibilities should surely be Smart ForTwo. A little car with a sufficient „town“ output and what is necessary is its very little consumption.It is driven by 3 – cylinders suprex turbo engine placed in the back together with air cooler. Its output is 54 kW (the most efficient version) at 5200 rpm. Nothing big, but to the city satisfactory enough. The consumption is from 4.6 to 6.5 litres for 100 km. Does a name Stephanos Attard (46) say something to you? Maybe yes, but for the others who do not know, he is a Greek racer and a champion of a serial 4×4 Rally Races. It was him who striked upon an idea to creat a monster truck in a cloth Smart. Quite crazy idea, isn´t it? But as you can see, not impossible. It did not take much time and with the help of Daimler Chrysler representation he created the unique car which hides in itself features of a real off-road car and to a certain extent features of a comfort private car. As the basics for this wonder became Smart ForTwo which was combined with still living Unimog 406.The complete chassis was used together with a complete mechanics and wheels with the diameter 1.4 metres, just from the Unimog. The main drive unit comes also from Unimog 406 and it is 5.7 litres turbodieselwith the output 84 hp (61 kW). There is an old 6 speed manual gear box which consists of two grades for the rear drive. We are used to the most possible lowering of a car as to the tuning. But in this case it is just vice-versa. This Smart rides 65 cm above the ground (between the chassis and the ground) whereby it is 3.7 metres height, what is approximately 2.2 metres more than the classic Smart ForTwo. There is nothing more beautiful than to joint comfort with the maximal possible fun. Next articleLet’s add some colour to this Melbourne winter!